BlueOrbit Solutions develops and sustains prepackaged dashboard solutions for various industries and functions. As a recognized leader in information management innovations, we offer solutions that are grounded in our deep functional and industry experience and built with a focus on business functionality. They are designed to lower implementation risks and decrease time-to-value. Our solutions apply newer advanced technologies to the changing needs of the market. We have created horizontal point solutions such as Expense Management, IT service management and Call Center analytics. We also have created accelerators such as QlikExpress, which is a process enablement solution for Qlik development. Travel and entertainment (T&E) expenses can be one of the largest line items in an enterprise budget. 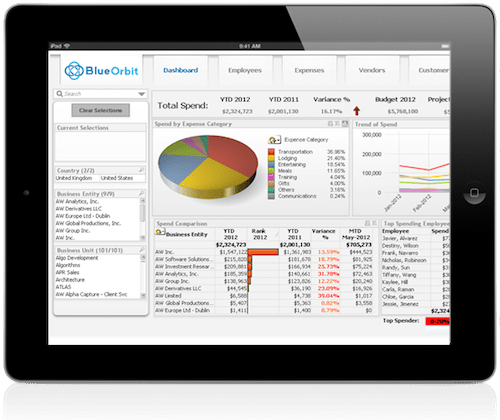 Expense Analyzer from BlueOrbit draws on multiple data sources for a broader, more holistic view of T&E expenses and their impact on the bottom line. It delivers sophisticated analyses and on-demand insight to business leaders, enabling quicker data-driven decisions on T&E spending and employee activity.